On Friday, the Bureau of Labour Statistics will release its report on America’s employment situation during September. If the numbers are roughly in line with these expectations and don’t show any drastic developments in the labour market, they would make for a fairly routine and boring jobs report. And that would be ok, because many economists agree that the overall labour market right now is solid. Just earlier on Thursday, we learned that initial jobless claims — the count of newly laid off people filing for unemployment insurance for the first time — remained near the lowest level since the 1970s. The four-week moving average of claims, which evens out the week-by-week volatility, fell to the lowest level since 1973. 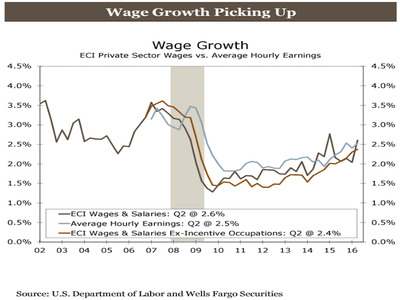 Wells FargoThe Employment Cost Index (ECI), which measures the cost of labour to employers, has recently perked up. 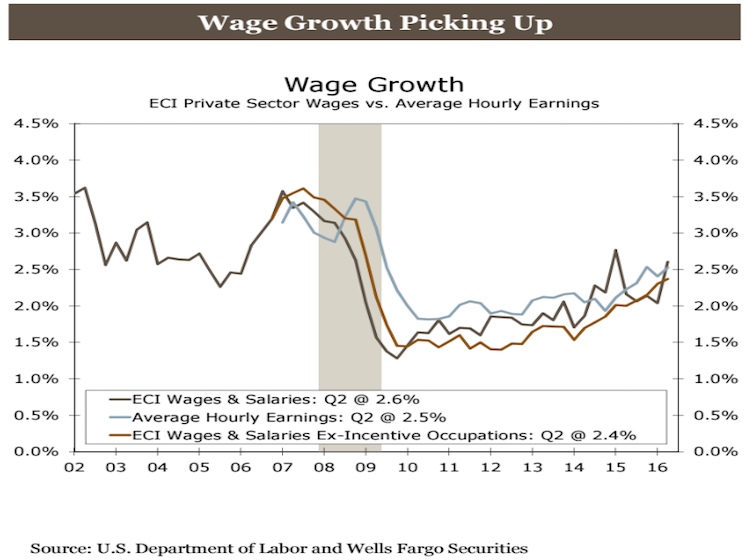 And wage growth, one of the most sluggish parts of the labour market, has risen in recent months. The main thing Wall Street will be watching in the jobs report is whether it changes the likelihood of the Federal Reserve raising its benchmark interest rate in December. On Thursday, bets among futures traders reflected a 62% probability that the Fed would move at that meeting. Traders are taking the preceding meeting in November off the table for two reasons: its closeness to the elections could have aggravated political and market consequences, and the Fed may want to avoid raising rates at meetings without scheduled press conferences. There will be two more jobs reports before the Fed’s December meeting. And so, reading the Fed tea leaves based on this report may be premature — especially if it’s not terrible. The pace of jobs growth has been trending lower, and is expected to continue doing so. That’s partly because the unemployment rate is at an eight-year low, and there are fewer people actively looking for work. Deutsche Bank Chief International Economist Torsten Sløk said the loss in energy jobs as oil prices collapsed, and in manufacturing jobs as the strengthening dollar reduced demand for US exports, can also be blamed for the job-growth slowdown. Still, the jobs market has helped consumer spending, which in turn continues to be the major driver of economic growth as businesses invest less. In a client note on Thursday, Deutsche Bank’s Chief US Economist Joseph LaVorgna wondered for how long the labour market can continue doing the economy’s “heavy lifting”. “As we have discussed in past publications, GDP growth in the ongoing cycle has been entirely supported by labour market gains, while productivity has been abysmal,” LaVorgna wrote. Productivity growth — a gauge of economic output per hour worked — has averaged 1.4% over the last 13 years, below the 2.2% long-term trend since World War II. Economists have pointed to more efficient technology and lower business investment as some reasons for this. Another factor is that the economy is nearing full employment, or a situation where all the spare labour capacity is being used. If workers’ contribution to productivity slows any further, it could drag down overall economic growth, and push the Fed’s plans to raise interest rates further into the future, LaVorgna wrote.